VA 282: Appeared in July 1933 as a renumbering of the northern piece VA 839. Ran from VA 7 east of Berryville to short of US 340 Gaylord. VA 282 was extended north to US 340 in August 1933 (CTB Minutes). 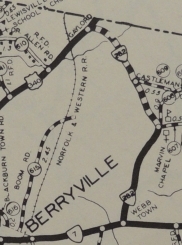 VA 282 was downgraded to parts of SR 608 and SR 612 in May 1943 (CTB Minutes).